Well, I didn't get enough work done on Space Douchebag this week. I did, however, still get more than enough done to warrant a post. I started the week off by making a couple more enemies. 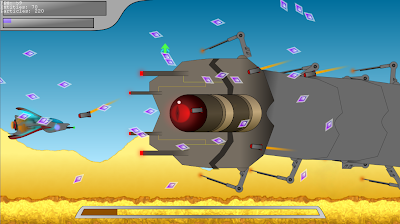 First, there are flying turrets that aim directly at the player and move in erratic patterns. I also added bulkhead doors that must be destroyed before they crash into you. Finally, I made asteroids that randomly split when destroyed. Gotta have 'em in your shmup! After that, I finally implemented the first boss. It's not quite complete, but it's close. It has several different attacks. First, it can charge at the player. It scoots back a little right beforehand, which is the cue to get out of there. It can also summon a number of enemies from the stage, and at half health it can fire a large beam. Finally, it has a continual attack thanks to its' many limbs. each limb moves independently and can occasionally fire an aimed shot at the player. At half health, these limbs fire 3 shots, and at 25% hp or lower they fire 5 and a homing missile. Speaking of missiles, I decided that the player didn't really have enough incentive to actually kill the jumping worm enemies, and made them fire missiles from their tail. I've found that this works rather well, and makes the game a little more hectic. Finally, I have a bit of good news: while all of this was happening, I finally finished AMAZE's animation system! I've been working on it bit-by-bit since, although I don't really have enough new content to make a post yet. Edit: Here's a screenshot of the first boss! Space Douchebag - 8 - Level One, Complete!